A Retail Sales Rep constantly maintains a long-lasting relationship with customers and ensure that the sales quota is achieved. The core roles and responsibilities shouldered by these professionals are greeting and directing customers, providing accurate information, answering customers queries, conducting price or feature comparison, cross-selling products, ensuring goods stocking, managing returned goods, coordinating with retail sales representative team, keeping customers informed of discounts or special offers, providing feedback to store manager, and collecting payments from customers. 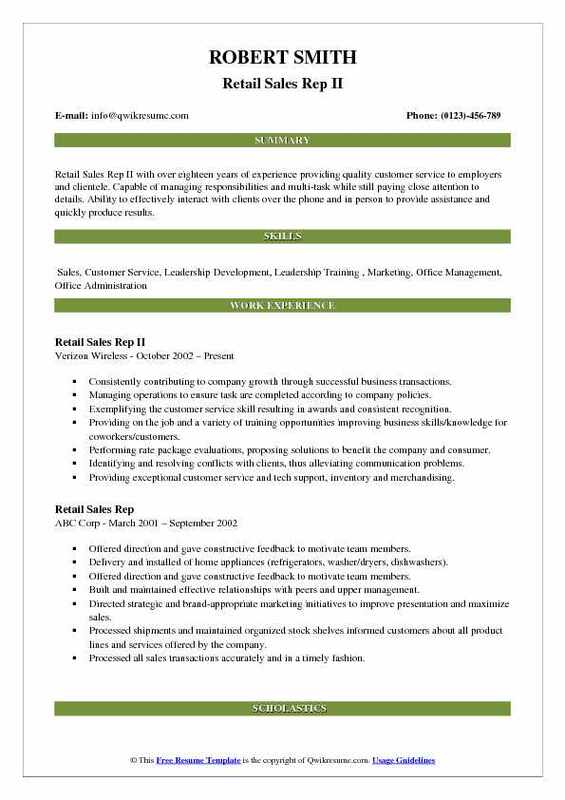 The job skills that are considered essential and to be listed in the Retail Sales Rep resumes are proven work experience, a basic understanding of retail sales processes, knowledge of inventory stocking and consumer behavior principles, basic math skills, a success record of overcrossing sales, persuasion and excellent communication skills. Eligible resumes make a mention of a high school diploma with relevant experience. Summary : Retail Merchandising, Sales Rep. or Customer Service Rep with 12 years of expeirnece and who is highly energetic, outgoing and detail-oriented. Handles multiple responsibilities simultaneously while providing exceptional customer service. Highlights Inventory control procedures, Employee scheduling, Cash handling, accuracy, Store planning and design, Organized Time management, Detail-oriented, Excellent multi-tasker. Managed the storefront product lines of dairy goods to be visually attractive for the incoming customers. Stocked and rotated products and partnered with store decision makers on displays. Constantly hit monthly and daily goals by offering a personalized solution to each and every guest. 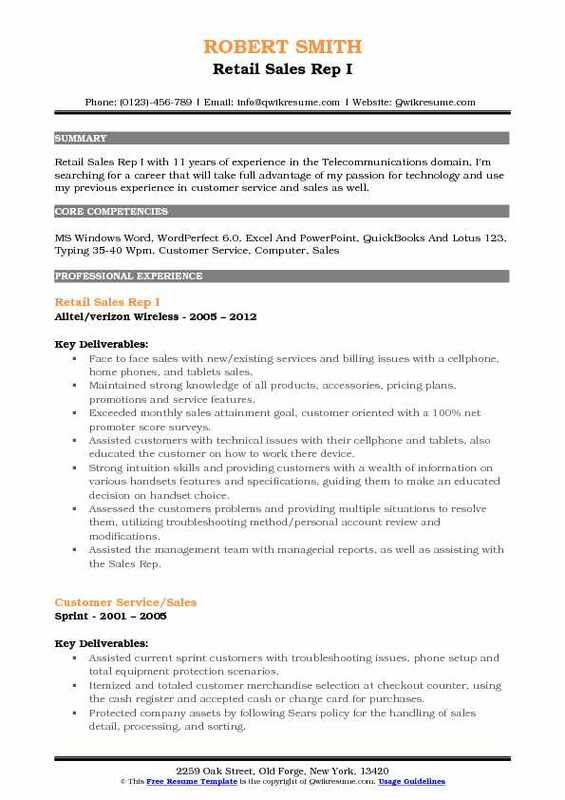 Headline : Retail Sales Rep with 6 plus years of experience. Experienced Retail Merchandiser and Sales Representative with expertise in managing product placement, end of aisle product displays, points of purchase displays to manufacturer best advantage, and reading of Planograms. 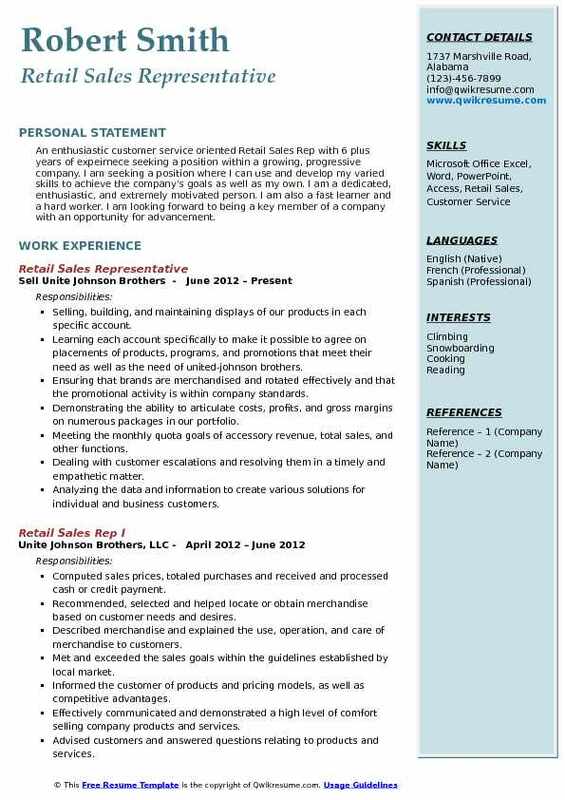 Skills : PC, Practice W/ Medical Office Data Entry, Communication, And Organizing, Customer Service, Computer, Sales, Marketing, All General Office Duties, People. Meeting and exceed assigned goals for customer experience and reputation, sales and service, revenue. Demonstrating the right customer behaviors defined by delivering an extraordinary experience. Participating with store management in role plays on a regular basis to demonstrate "what right looks". Demonstrating the AT&T products to clients in accordance with the retail experience. Driving results by keeping staff updated with daily, weekly and monthly sales reports. Partnering with the store management to successfully launch new products, services or processes. Actively inspecting post-launch and drive improved results with best practices. Attending training on new products and promotions to sell with confidence. Providing a fast and friendly customer experience while giving suggestive ideas to help their build. Helping promote a safe work environment be enrolling in lowes work safe program. 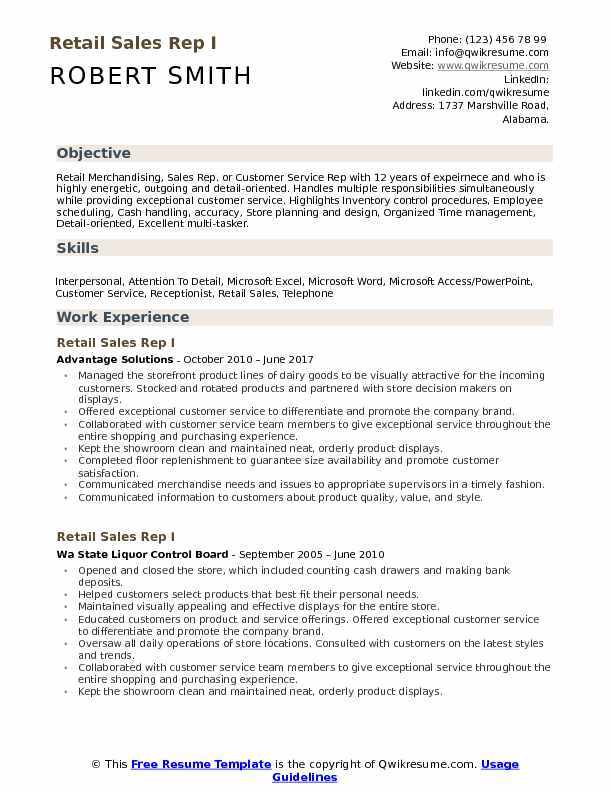 Summary : Retail Sales Rep II with over eighteen years of experience providing quality customer service to employers and clientele. Capable of managing responsibilities and multi-task while still paying close attention to details. Ability to effectively interact with clients over the phone and in person to provide assistance and quickly produce results. Consistently contributing to company growth through successful business transactions. Managing operations to ensure task are completed according to company policies. Exemplifying the customer service skill resulting in awards and consistent recognition. Providing on the job and a variety of training opportunities improving business skills/knowledge for coworkers/customers. Performing rate package evaluations, proposing solutions to benefit the company and consumer. Identifying and resolving conflicts with clients, thus alleviating communication problems. Providing exceptional customer service and tech support, inventory and merchandising. Ensuring that all aspects of customer needs are fulfilled ensuring exceeded satisfaction. Balancing the needs of multiple customers simultaneously in a fast-paced retail environment. Objective : Junior Retail Sales Rep with 2 having Customer-focused Retail Sales Associate experience with a solid understanding of the dynamics of the retail apparel. 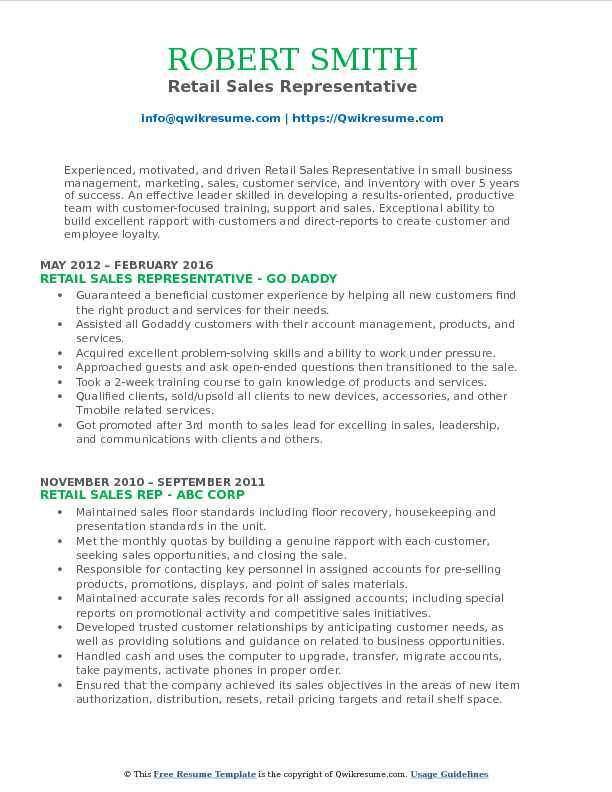 Energetic and reliable Retail Sales Associate skilled in dedicated Customer Service. Responsible Cashier experienced at managing front of store in busy environments. Friendly and energetic with strong communication and organizational abilities. Seeking role of increased responsibility where strengths in service and sales will be valuable. Estimated the quantity and cost of merchandise required, such as paint or floor covering. Recommended, selected, and helped locate or obtained merchandise based on customer needs and desires. Watched for and recognize security risks and thefts, and know how to prevent or handle these situations. Solicited customers potential product needs and promotes the appropriate product to meet their needs. Headline : An enthusiastic customer service oriented Retail Sales Rep with 6 plus years of expeirnece seeking a position within a growing, progressive company. I am seeking a position where I can use and develop my varied skills to achieve the company's goals as well as my own. I am a dedicated, enthusiastic, and extremely motivated person. I am also a fast learner and a hard worker. I am looking forward to being a key member of a company with an opportunity for advancement. Selling, building, and maintaining displays of our products in each specific account. Learning each account specifically to make it possible to agree on placements of products, programs, and promotions that meet their need as well as the need of united-johnson brothers. Ensuring that brands are merchandised and rotated effectively and that the promotional activity is within company standards. Demonstrating the ability to articulate costs, profits, and gross margins on numerous packages in our portfolio. Meeting the monthly quota goals of accessory revenue, total sales, and other functions. Dealing with customer escalations and resolving them in a timely and empathetic matter. Analyzing the data and information to create various solutions for individual and business customers. Objective : Dedicated Jr. Retail Sales Rep with 3 plus with goals to obtain a growing educational foundation with a motivational team. That will give me the freedom to grow, utilize my skills, experience, and have the ability to use my time wisely as a working progress in the employment industry. 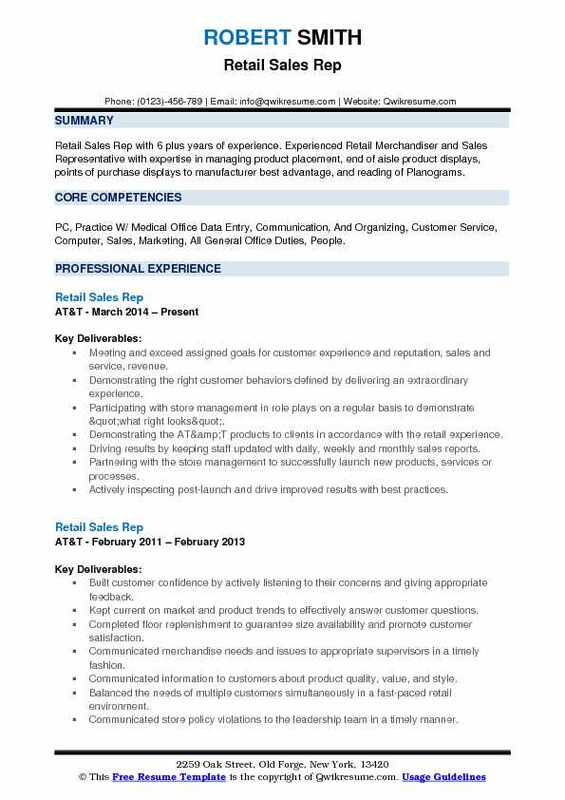 Skills : Cashier, Office Assistant, Retail, Customer Service, Computer, Sales, Marketing, All General Office Duties, People. Responsible for adhering to all sales processes and procedures as established by the regional corporate team to meet the desired sales goals. Cultivating the business relationships with customers at Walmart and grocery stores to drive business development. Deepening focus on winning behaviors by ensuring performance development and engagement discussions occur regularly with my supervisor. Managing and tracking stores insurance take rate, working with management to create contests to increase stores performance. Ordering products, shipping, inventories and track sales, customer service. 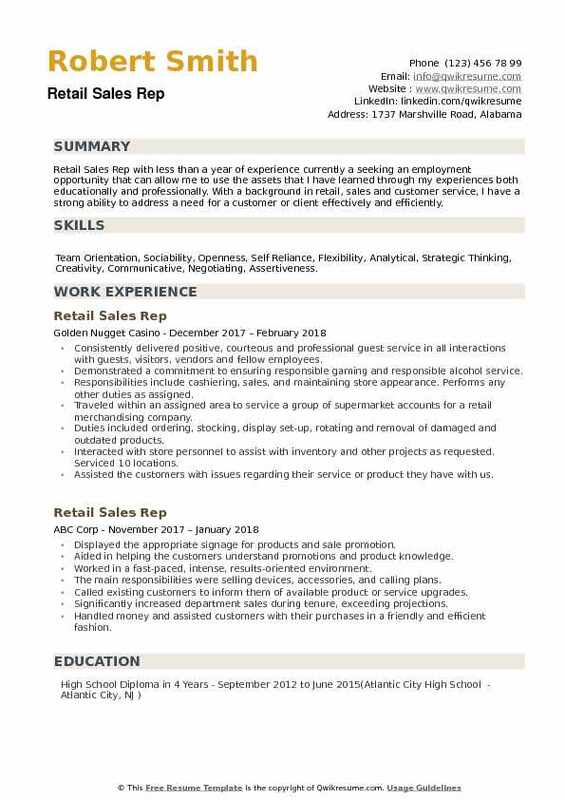 Headline : Experienced, motivated, and driven Retail Sales Representative in small business management, marketing, sales, customer service, and inventory with over 5 years of success. An effective leader skilled in developing a results-oriented, productive team with customer-focused training, support and sales. Exceptional ability to build excellent rapport with customers and direct-reports to create customer and employee loyalty. Guaranteed a beneficial customer experience by helping all new customers find the right product and services for their needs. Assisted all Godaddy customers with their account management, products, and services. Acquired excellent problem-solving skills and ability to work under pressure. Approached guests and ask open-ended questions then transitioned to the sale. Took a 2-week training course to gain knowledge of products and services. Qualified clients, sold/upsold all clients to new devices, accessories, and other Tmobile related services. Got promoted after 3rd month to sales lead for excelling in sales, leadership, and communications with clients and others. Conducted routine follow-ups with customers who showed interest in specific products or services. 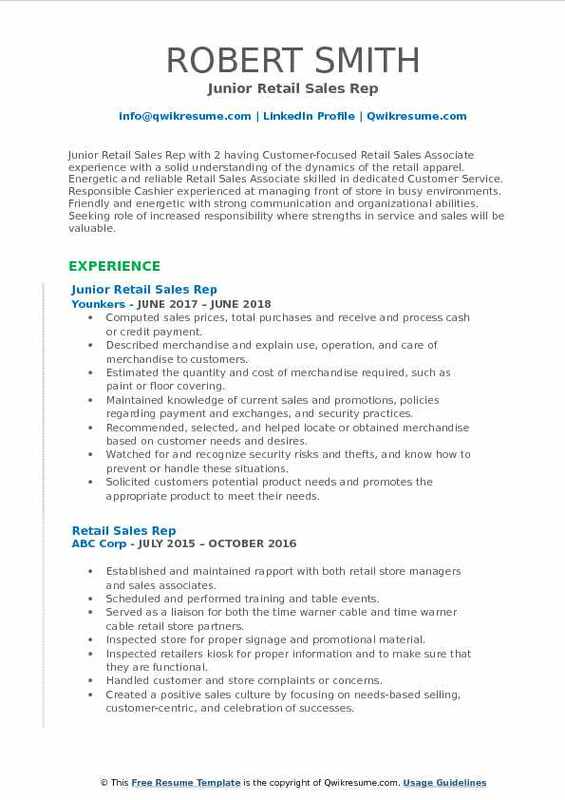 Summary : Retail Sales Rep I with 11 years of experience in the Telecommunications domain, I'm searching for a career that will take full advantage of my passion for technology and use my previous experience in customer service and sales as well. Face to face sales with new/existing services and billing issues with a cellphone, home phones, and tablets sales. Exceeded monthly sales attainment goal, customer oriented with a 100% net promoter score surveys. Assisted customers with technical issues with their cellphone and tablets, also educated the customer on how to work there device. Strong intuition skills and providing customers with a wealth of information on various handsets features and specifications, guiding them to make an educated decision on handset choice. Assessed the customer's problems and providing multiple situations to resolve them, utilizing troubleshooting method/personal account review and modifications. Assisted the management team with managerial reports, as well as assisting with the Sales Rep.
Made recommendations for a valuable phone and plan based on the customer’s needs. 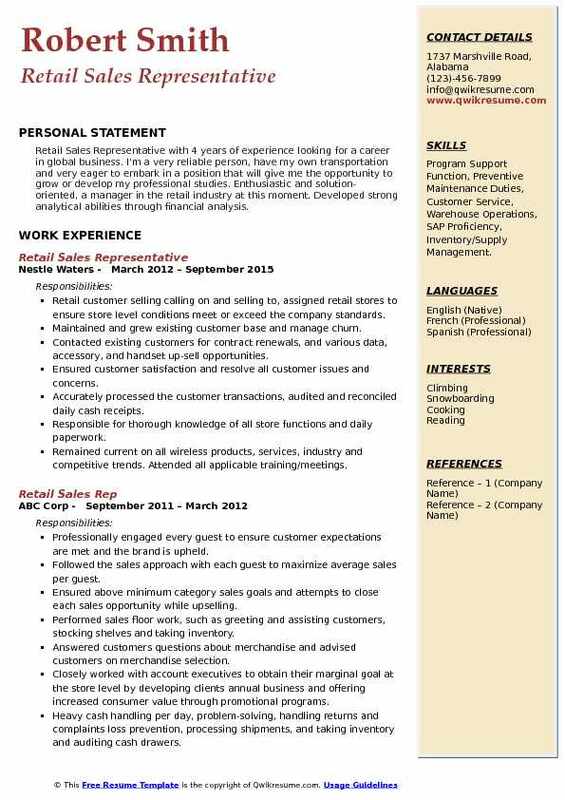 Objective : Retail Sales Representative with 4 years of experience looking for a career in global business. I'm a very reliable person, have my own transportation and very eager to embark in a position that will give me the opportunity to grow or develop my professional studies. Enthusiastic and solution-oriented, a manager in the retail industry at this moment. Developed strong analytical abilities through financial analysis. Skills : Program Support Function, Preventive Maintenance Duties, Customer Service, Warehouse Operations, SAP Proficiency, Inventory/Supply Management. Retail customer selling calling on and selling to, assigned retail stores to ensure store level conditions meet or exceed the company standards. Maintained and grew existing customer base and manage churn. Contacted existing customers for contract renewals, and various data, accessory, and handset up-sell opportunities. Ensured customer satisfaction and resolve all customer issues and concerns. Accurately processed the customer transactions, audited and reconciled daily cash receipts. Responsible for thorough knowledge of all store functions and daily paperwork. Remained current on all wireless products, services, industry and competitive trends. Attended all applicable training/meetings. Responsible for building the customer relationships that are the foundation of retail sales success. 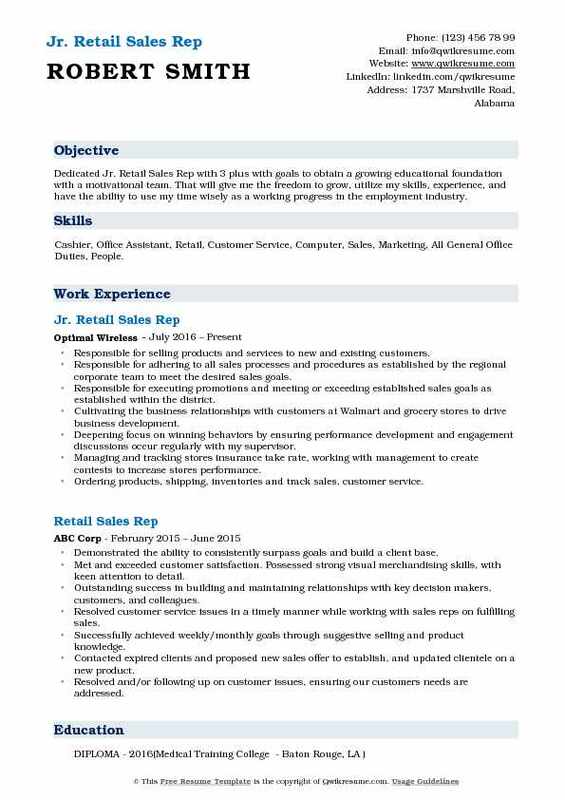 Objective : Retail Sales Rep with less than a year of experience currently a seeking an employment opportunity that can allow me to use the assets that I have learned through my experiences both educationally and professionally. With a background in retail, sales and customer service, I have a strong ability to address a need for a customer or client effectively and efficiently. Skills : Team Orientation, Sociability, Openness, Self Reliance, Flexibility, Analytical, Strategic Thinking, Creativity, Communicative, Negotiating, Assertiveness. Consistently delivered positive, courteous and professional guest service in all interactions with guests, visitors, vendors and fellow employees. Demonstrated a commitment to ensuring responsible gaming and responsible alcohol service. Responsibilities include cashiering, sales, and maintaining store appearance. Performs any other duties as assigned. Traveled within an assigned area to service a group of supermarket accounts for a retail merchandising company. Duties included ordering, stocking, display set-up, rotating and removal of damaged and outdated products. Interacted with store personnel to assist with inventory and other projects as requested. Serviced 10 locations. Assisted the customers with issues regarding their service or product they have with us. Met and exceeded the monthly goals for the required sales metrics while also providing customers with face to face technical support and customer service. Met and exceeded quota/revenue target for the net and gross activations, customer renewals, data revenue, accessories, handsets, and enhanced services.